Skylar Laine Gets the Boot on "Idol"
The 18-year-old country rocker from Mississippi got kicked off this week's "American Idol." Skylar Laine, the 18-year-old country rocker from Mississippi known for her twangy singing voice, got kicked off Thursday's edition of "American Idol." 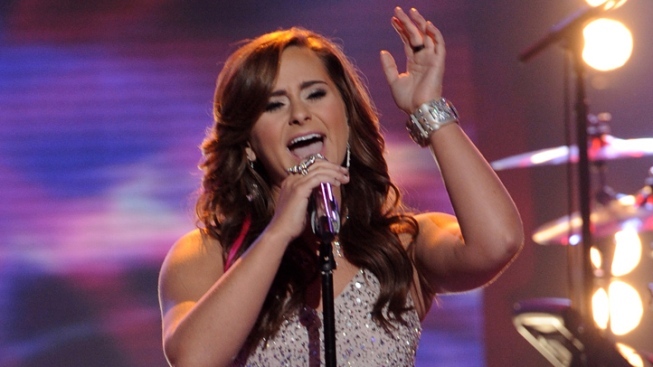 It was an unfortunate night for Skylar Laine on "American Idol." The 18-year-old country rocker from Brandon, Miss., who imbued Creedence Clearwater Revival's "Fortunate Son" and Dusty Springfield's "Say You Love Me" with her twangy sensibilities on Wednesday's show was revealed to have received the fewest viewer votes Thursday on the Fox singing contest. Laine was joined at the bottom by Hollie Cavanagh, the 18-year-old balladeer from McKinney, Texas, who opened Wednesday's installment with a pop-infused take on Ike and Tina Turner's "River Deep Mountain High," and later dialed it down with the Leona Lewis hit "Bleeding Love." "They both sang their faces off last night," said "Idol" judge Randy Jackson. The other singers remaining in the competition are booming 20-year-old gospel singer Joshua Ledet of Westlake, La. ; bluesy 21-year-old pawn shop worker Phillip Phillips of Leesburg, Ga.; and budding 16-year-old pop diva Jessica Sanchez of San Diego. The four remaining finalists will return to the stage next week. PLAY IT NOW: How Sick Was Ryan Seacrest On 'American Idol'?